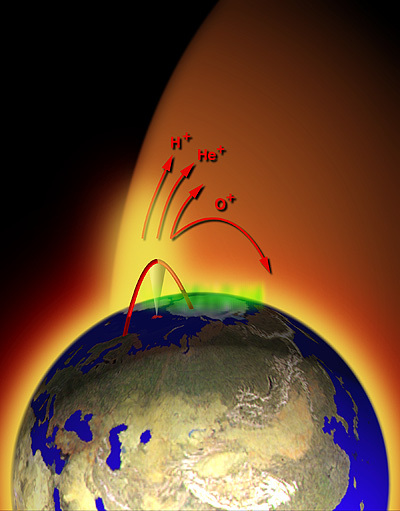 Jan. 7, 1999: Just three months after a solar storm blew away part of the Earth's upper atmosphere, a team of U.S. scientists plans a CAPER to probe a fountain of ions that is always blowing into space. CAPER, the Cleft Accelerated Plasma Experimental Rocket, will carry one of the most complex instrument packages ever launched into the region where the Earth's atmosphere is directly exposed to space. 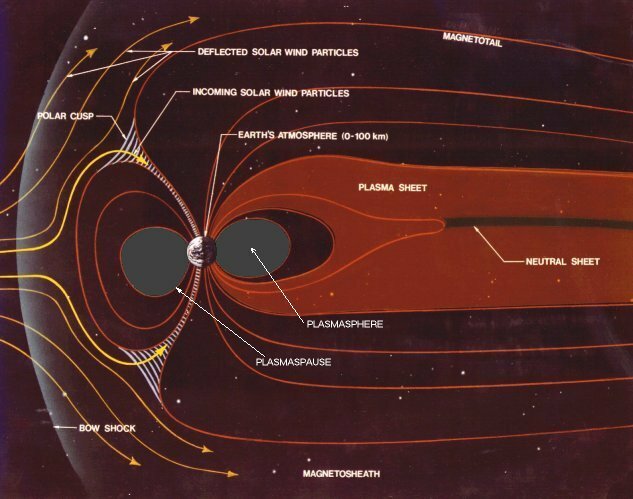 "We're studying a region that is believed to provide the majority of the mass that makes up the magnetosphere," said Victoria Coffey, a scientist at NASA's Marshall Space Flight Center. 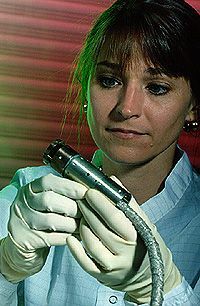 Coffey is the experiment scientist for two CAPER instruments, TECHS (the Thermal Electron Capped Hemisphere Spectrometer) and TICHS (the Thermal Ion Capped Hemisphere Spectrometer). CAPER is scheduled for launch from the Andoya Rocket Range at Andoya, Norway, into the Arctic Circle, no earlier than Jan. 11, deep in winter in that part of the world. The mission has been in development for more than three years. The launch window extends to Jan. 25. The Earth's magnetic field forms an immense invisible shield shaped like a giant gas bag. On the day side, the solar wind compresses the bag to within 160,000 km (100,000 mi) or so of Earth's surface. On the night side, the wind drags it out to form a magnetotail more than a million miles into deep space. However, the Earth is exposed to space at the north and south magnetic poles where the magnetic field lines are open to space because the earth's magnetic field lines extend outward into space rather than looping around the globe. "It's the only place where solar wind particles can directly enter Earth's ionosphere," Coffey explained. The cusp, as this region is called, has been studied by a variety of spacecraft, including Dynamics Explorer 1 (DE-1) in the 1980s, and, since 1996, the Polar spacecraft. Instruments aboard DE-1 and Polar have provided strong evidence that the magnetotail is filled by electrified gas not from the solar wind, as scientists had first thought, but from the earth's own atmosphere. SCIFER's 1995 flight set the stage for CAPER. Polar routinely samples the auroral plasma fountain, and was fortunate to have its Thermal Ion Dynamics Experiment (TIDE) at its most sensitive setting when a coronal mass ejection from the sun really stirred things up in September. However, the auroral fountain is spewing all the time, even without the sun helping things out. "The main question is, How do these very low-energy particles defy gravity and get to those altitudes?" said Coffey. An initial study was made by SCIFER - the Sounding of the Cleft Ion Fountain Energization Region - on Jan. 25, 1995. It showed that plasmas (electrified gases) are accelerated to energies of a few hundred electron volts in a few well-defined regions of the cleft or cusp. However, the Earth is exposed to space at the north and south magnetic poles where the magnetic field lines are open to space because of their dipole (two-pole) shape. SCIFER flew north over the heart of the Svalbard Archipelago, attaining an apex of nearly 1500 km (900 mi), before reentering the atmosphere and impacting the north polar ice cap. As the payload traveled upward out of the ionosphere, the plasma density dropped rapidly. Then, as the payload traveled toward the pole it entered a region of much higher plasma density near the apex, the fountain proper. This allowed scientists to "zoom in" on the source of the fountain and to investigate how solar wind energy is converted into plasma flow. Scientists now theorize that the instabilities in the electrical current flowing into the ionosphere - the uppermost layer of Earth's atmosphere - energize ions so they escape into the magnetotail. 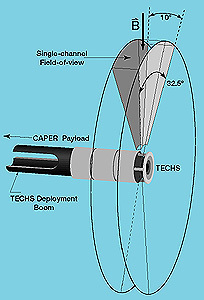 CAPER's mission is to carry instruments more sensitive than SCIFER carried, and to measure conditions at altitudes lower than where DE-1 or Polar could sample. NASA/Marshall, NASA/Goddard, and Southwest Research Institute are providing two instruments called TICHS - the Thermal Ion Capped Hemisphere Spectrometer - and TECHS - the Thermal Electron Capped Hemisphere Spectrometer. TICHS measures ions from 0.3 to 20 electron volts (eV) in energy. 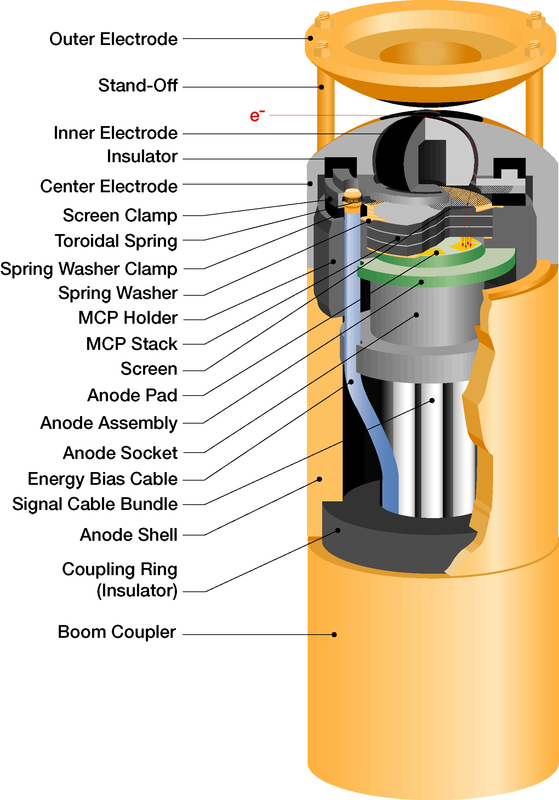 TECHS measures electrons with energies ranging from 0.3 to 60 eV. By comparison, the electron gun behind your computer screen sprays electrons at 10,000 eV (10 keV). "We're providing the electrostatic optics [the electrical components that concentrate electrons and ions much like a lens focusing light] and the deployment system," Coffey explained, "and Southwest Research is providing the electronics for the imaging system." The sensor end is a marvel of miniaturization whose reduced size and mass - and increased sensitivity - will make it ideal for small satellites. It only weighs 2.3 kg (compared to 17.1 kg for TIDE on Polar), and consumes only 5 watts of power (9.1 W for TIDE). The whole apparatus is 3 cm in diameter and 2.9 cm long (1.2x1.1 in), about as large as a 35mm film can. The receiving ends of TICHS and TECHS are pairs of hemispherical electrodes that act like a circular funnel to guide ions and electrons to a detectors the size of a dime. "It will detect particle flow relative to the Earth's magnetic field," Coffey explained. "The detector is built in slices that are direction sensitive. From that, you can detect the acceleration mechanism." Building the detector was a challenge because the dime-sized array of electrodes had to be fine enough to provide precise measurements of electron or ion flows in 30 slices. SCIFER, a predecessor instrument, only had 8 slices. "It's phenomenal that it's able to image in such a small area," Coffey said. During its flight to 1,200 to 1,400 km (720 to 840 mi) into space, CAPER will deploy its instruments so they can take measurements without the rocket body causing any interference. TECHS and TICHS, and a magnetometer will deploy on 80 cm (31.4-in) booms. Two 6.9 m (22.6 ft) booms will extend a radio antenna and a plasma-wave receiver provided by Cornell University. Finally, two ion and electron detectors from the University of New Hampshire will be deployed on shorter booms. At the same time, the University of Alaska and the University of Oslo will operate an array of instruments on the islands of Ny-Alesund and Longyearbyen. They are on the same magnetic longitude as the launch site at Andoya. The flight will be last less than half an hour. 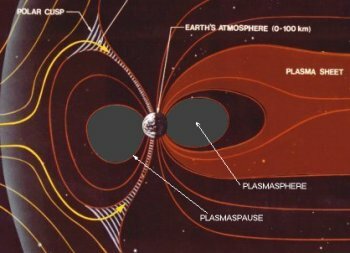 The exact date is not set because the team has to wait for the Polar spacecraft to indicate that conditions are just right in the magnetosphere. This will include observations by NASA/Marshall's Ultraviolet Imager aboard Polar. Shortly after local midnight, the Black Brant XII sounding rocket will rifle the payload skyward so the CAPER payload arcs along the field lines at about 10 a.m. local magnetic time. The instruments will deploy and data will be relayed to receiving stations at Andoya. The most important data will be taken at the apex or high point of the arc. Then CAPER will fall to Earth, crashing somewhere on the polar ice. No recovery is planned since Arctic operations during polar winter are especially risky. Coffey said that around March or April the data will have been formatted and distributed to the science teams for analysis.